I came across this tablecloth and napkin set while preparing to depart for the SAGA Convention and thought I would share it with all of you in a quick post. The tablecloth is fairly small, only 34 inches square, with four little napkins, but is perfect as a tea set. 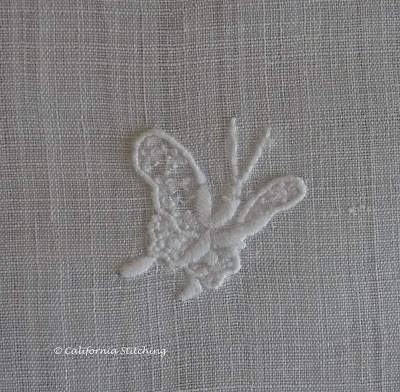 It is hand embroidered in white coton á broder on peach linen. 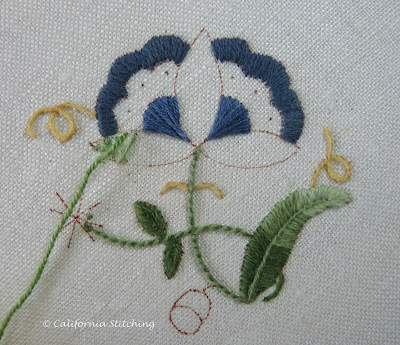 It is all satin stitch leaves and flowers with fil tiré in the leaves and seed stitches in in the flower centers. 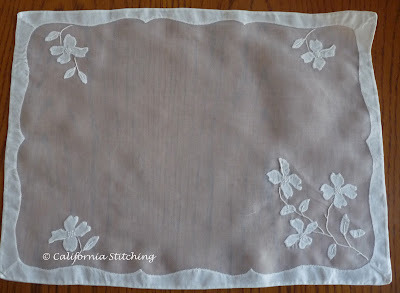 I love the beautiful satin stitch that was worked on this piece. If only I could do half as well! 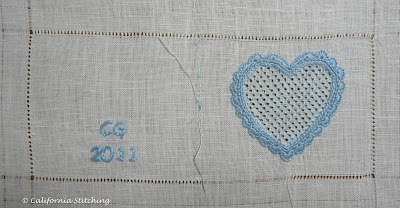 It has just a few hemstitched lines with little, perfect granitos at the end of each line. 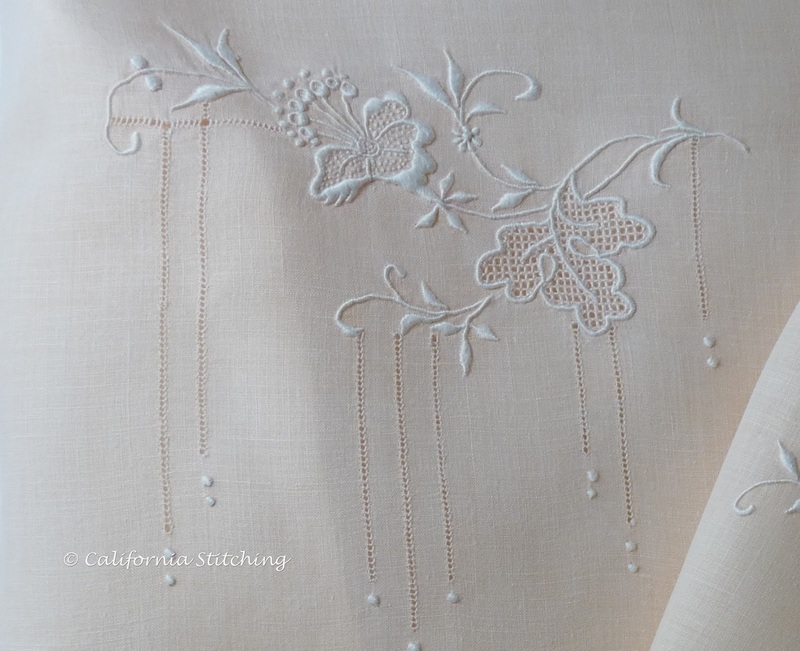 The border is finished with scalloped buttonhole edging in an intricate design. Isn't it just lovely? 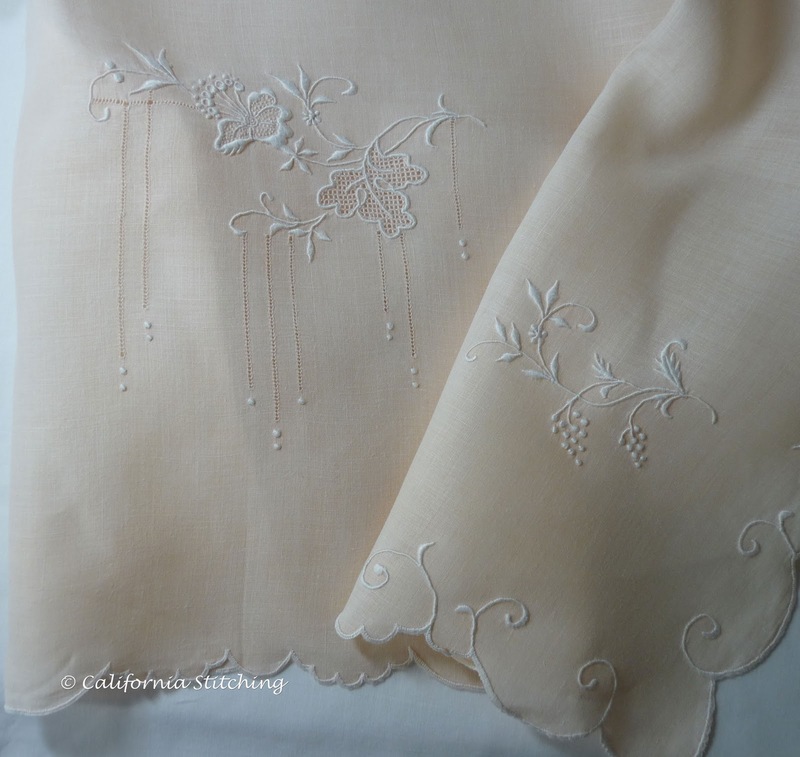 The embroidery is practically perfect, and I especially love the little round granitos which seem to pop from the fabric. I'm somewhat afraid to use it for tea as I might spill the tea and stain the linens! Did you notice that I figured out how to add the accent marks to coton á broder and fil tiré? I'm so proud of myself! We are off to San Francisco for a short trip. Have a great weekend! Remember this? It's my Chinese Flower Project that I finished last May. The reason that I'm posting again about it is to entice you to try needle painted project by pointing you to Trish Burr's latest post on "Smoother Shading". In it she gives several tips on how to successfully shade your stitching so it looks lifelike and well, like a painting with a needle! 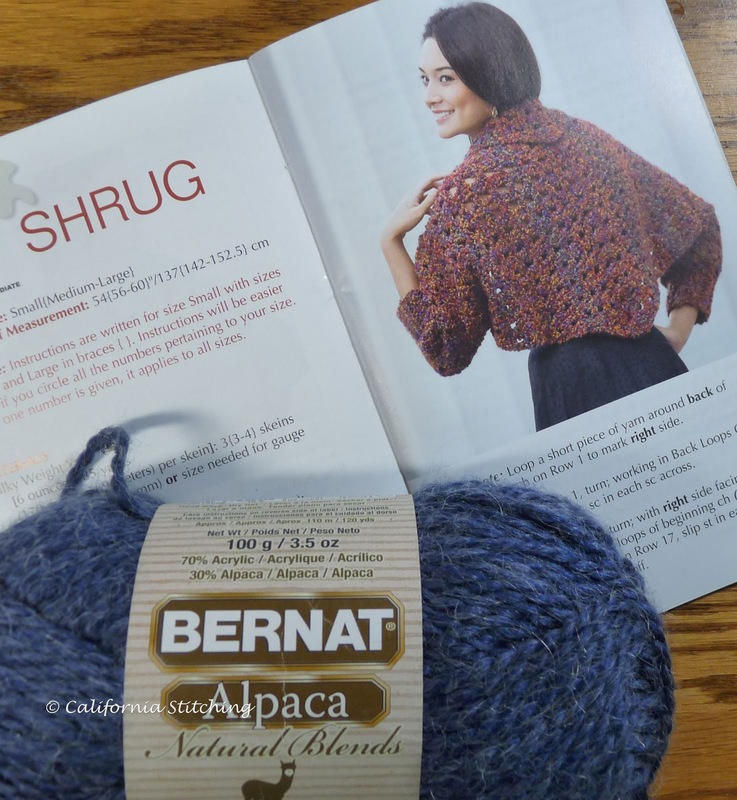 Many of her designs are available as downloads, so you don't have to buy a complete kit but can work with the threads in your stash. This is especially good if you have the complete range of DMC floss, as I do. Trish also has a project in the current Inspirations, No. 72. I hope you enjoy her tips and give this technique a try! It's very rewarding, but I have to admit, I'm terrified to try it all by myself. I need the photos and thread selections to do this successfully. This post is an update from one I started this morning and hit the "Publish" button too soon. I'm sure you've all done the equivalent on email by hitting "Send" too soon and sending out gibberish. Well, that was me today. 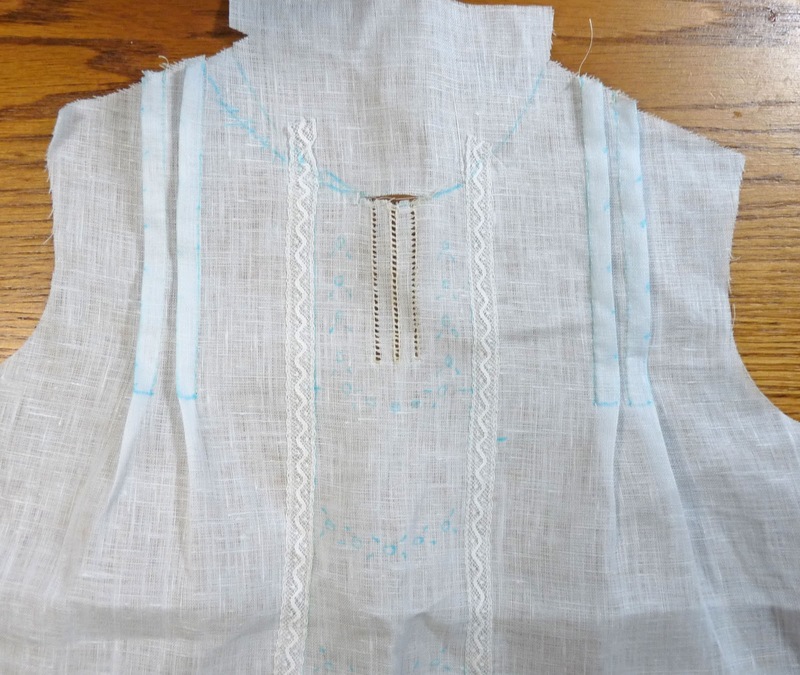 Now that I've finished the Schwalm Heart Needlebook, I'm trying to devote all available time to the Rosebuds and Hemstitched Baby Dress that I started at the SAGA Convention. This hasn't been easy, as this weekend was filled with my normal weekend chores; laundry, grocery shopping, cat box cleaning, a bit of gardening, etc., etc., etc. You know the drill. 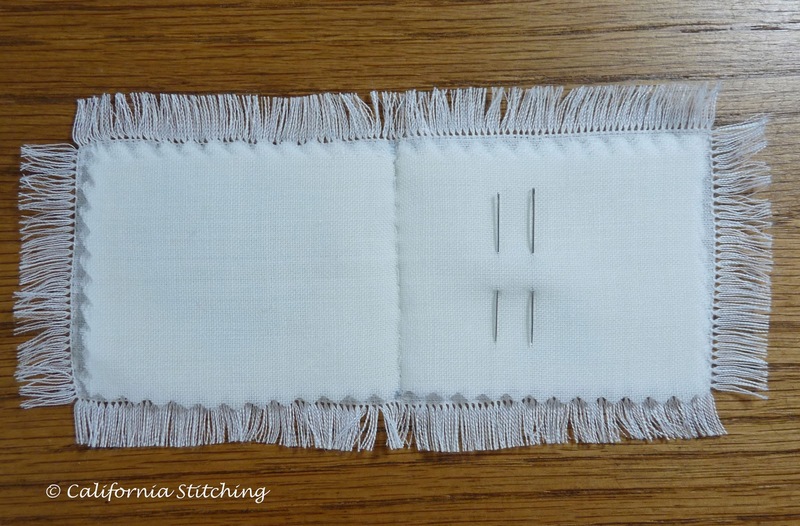 Since the last post, I've sewn the tucks in by hand. 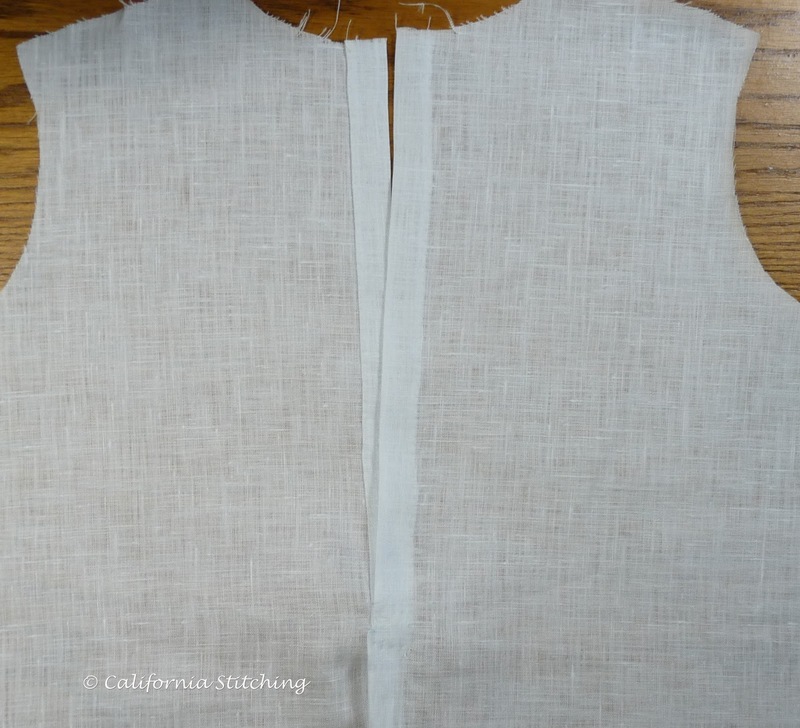 And have even done quite a bit on the hemstitching for the sleeves. 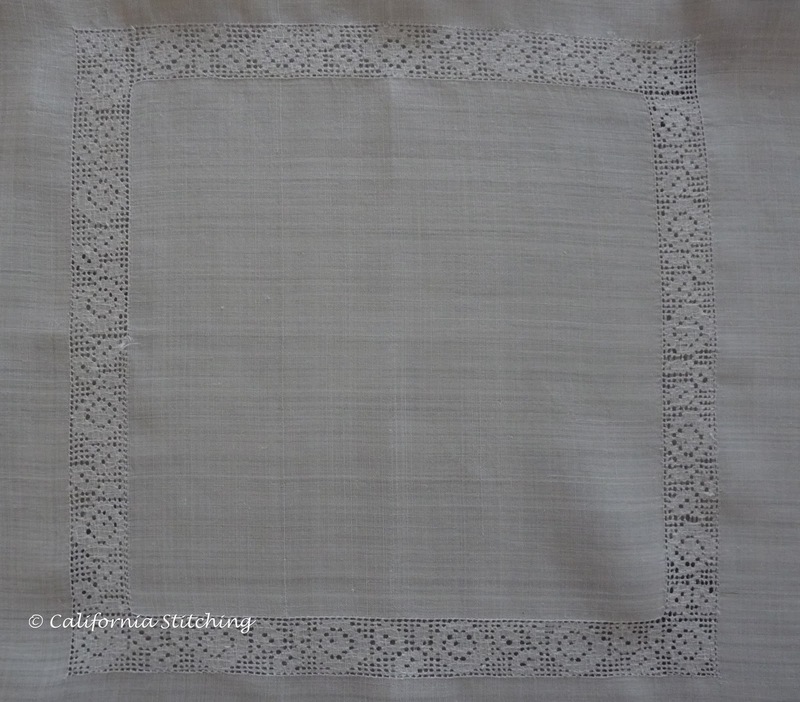 This is done on a block of fabric that is hemstitched before the two sleeves are cut out. I've even sewn in the back placket, using Jeannie's "no raw edge" placket method. However, I did leave a bit of a raw edge exposed but you can't really see it in the photo. Since it is sewn in by hand with a fairly large running stitch, I'll take it out and redo it so the raw edge is completely enclosed. It will be fun deciding which of all those lovely buttons I won from Jeannie to put on this gown. And that's as far as I've progressed. 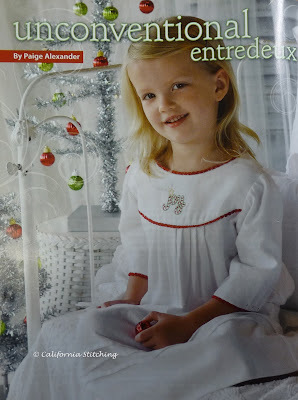 I'm dying to make a nightgown for my granddaughter, using white flannel with some Christmas design in it. And don't forget all of the other things I need to do, which are too many to list here. I may make a "projects" page so you can all see how woefully behind I'm getting with my projects. Here is the completed Schwalm Heart Needlebook. This was a fun project. It's a nice introduction to something entirely new for me and now I have yet another needlebook. On the left you can see where I stitched a line of blue coral knots on the spine to cover up the handstitching on the outside. The leaves of the needlebook are strips of wool challis, a lovely, fine fabric which is available from Heirloom Sewing for Children for $17.55 per half yard (internet special) or from Martha Pullen at $38.96 per yard. I made up the needlebook with three strips instead of the recommended two as I didn't want to waste a bit of this lovely fabric. This was one of many classes I've taken from Claudia Newton. She's a great teacher, knows her subject very well, and uses high quality fabrics and threads with well illustrated instructions. 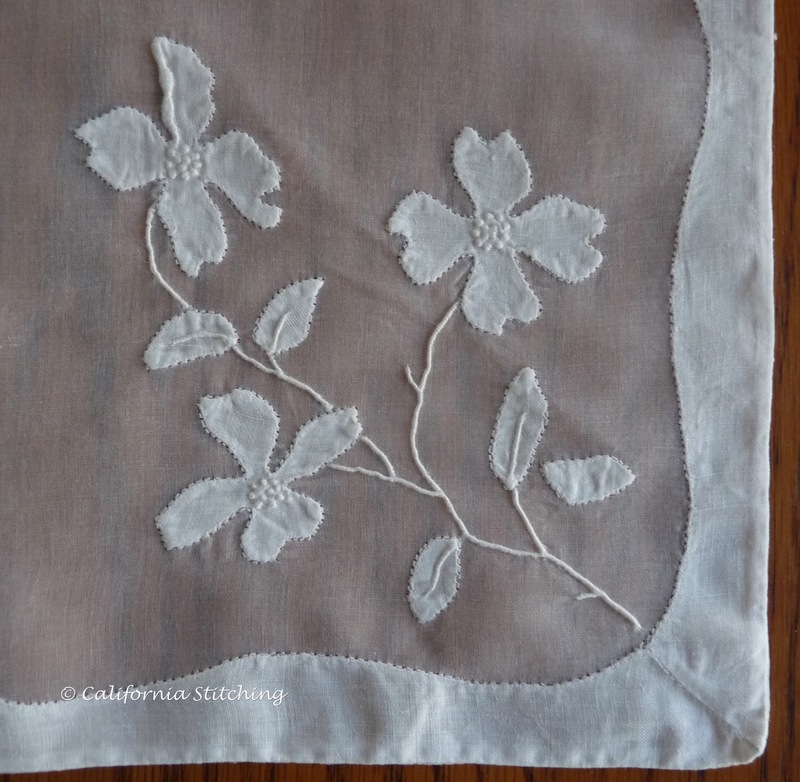 This class was an excellent introduction to Schwalm Embroidery which was made a bit easier by using the blue threads on white linen. There was nothing to dislike at all, except for the dark room we had for the class, but that wasn't Claudia's fault! She might be teaching the bonnet at the next SAGA Convention, in Atlanta in 2012. Luzine Happel. 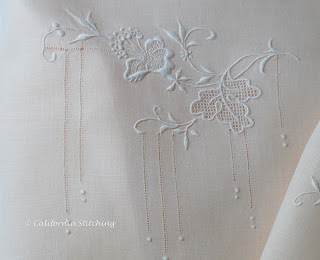 Basic Principles of Schwalm Whitework. Follow this link to read Mary Corbet's review and find out how to order it from Germany. I wish I can tell you I made this lovely bonnet, but alas, no, I didn't. However, I've been working on my Schwalm Heart Needlebook, a class from the SAGA Convention taught by Claudia Newton (who does not have a website so I can't provide a link). 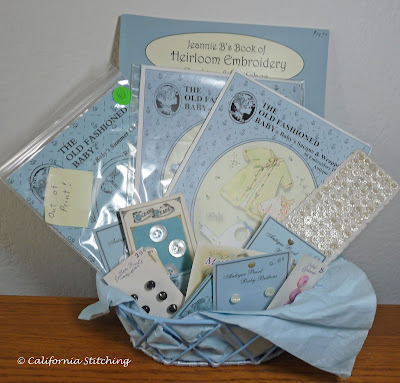 The needlebook takes the heart motif in the center for the cover of the book. 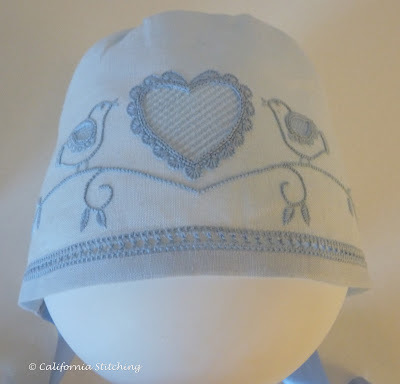 The bonnet also has a bird and flowers on it, with gorgeous hemstitching along the front. Don't you just love the balloon for the baby head? Now to the real life embroidery part. The heart outline consists of a row of coral stitches in the center, chain stitches just inside, and buttonhole half circles on the outside. 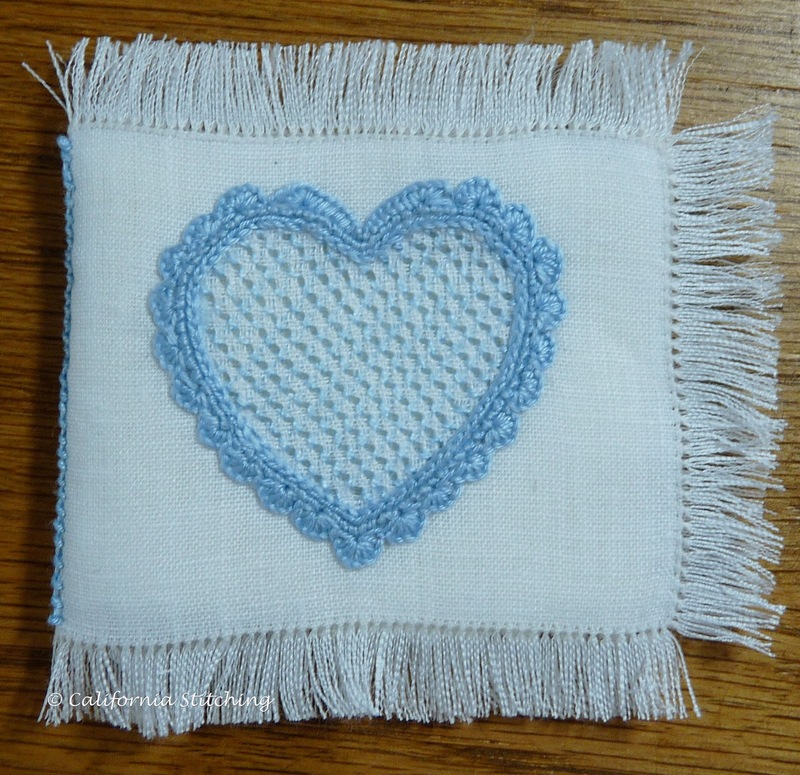 The heart embroidery is done in coton a broder. 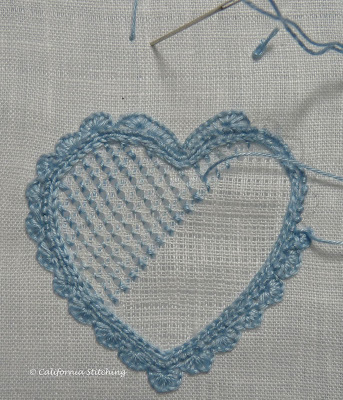 Once the chain and coral stitches are finished we started removing every fourth thread inside the heart. 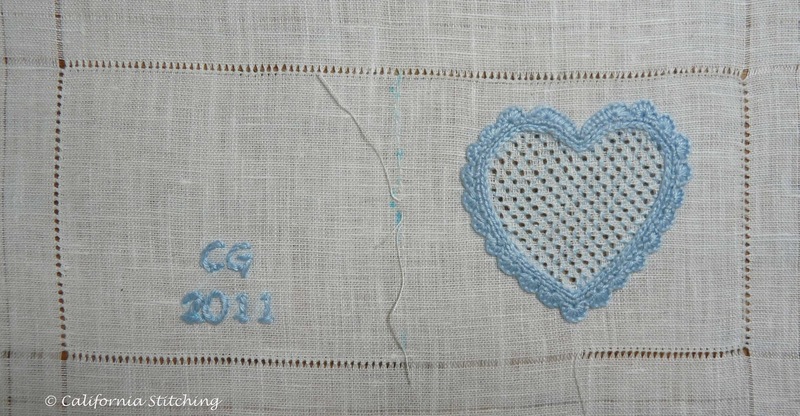 Then we had to use a Marburg filling stitch that is worked diagonally over the grid, using one strand of floss. Can you tell that something is very wrong with that bottom right diagonal row and the top left four rows? 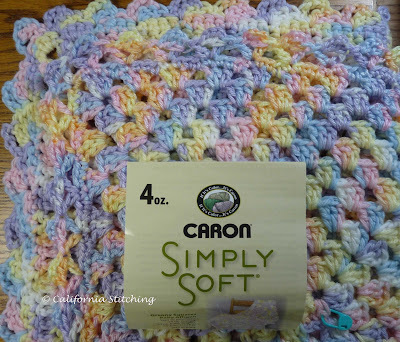 This drove me nuts for hours until, lying in bed in the wee hours of the morning, I realized that I used coton a broder instead of floss once I returned home from Convention. Here I've carefully picked out the coton a broder from the filling and replaced it with floss. 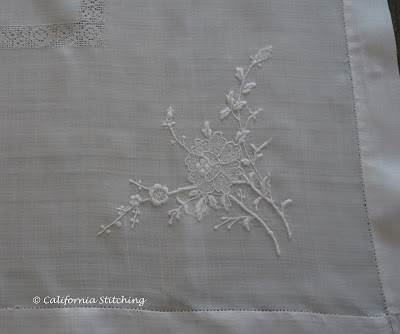 I've worked most of the hemstitching around the border of the piece and even embroidered by initials and year on what will be the back of the needlebook. However, I don't like the way it turned out and may change it a bit. 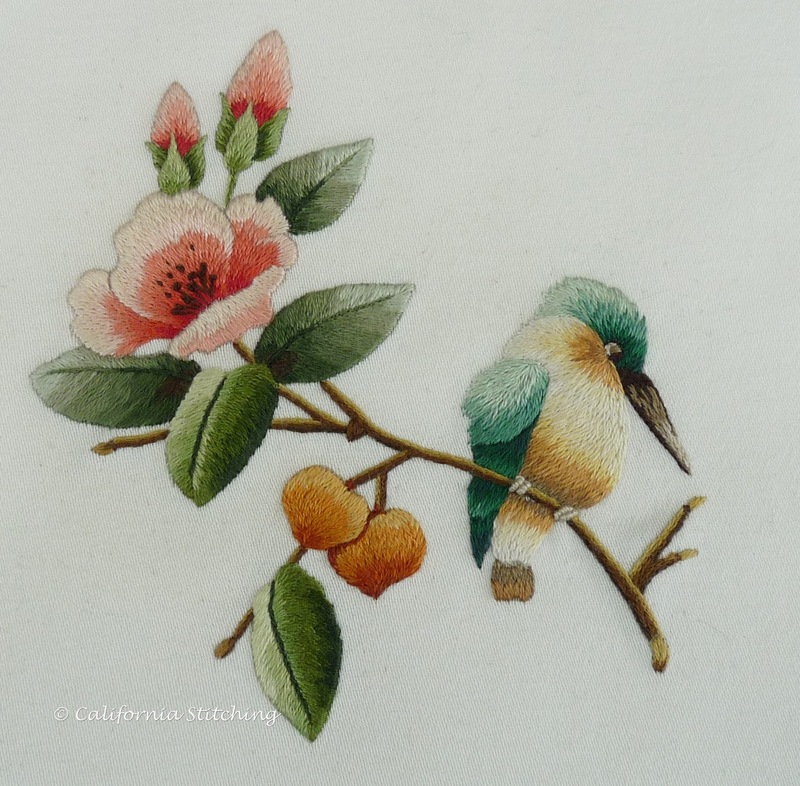 This is my first foray into Schwalm Needlework and to tell you the truth, I don't know a thing about it other than it consists of surface embroidery and withdrawn/pulled thread techniques. 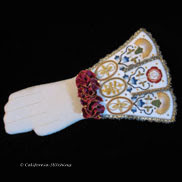 But if you would like to see a beautiful example of this along with some reference material, check out Mary Corbet's recent post on coton a broder and follow the links regarding the Schwalm piece in it. Just amazing, isn't it? I hope to finish this over the weekend and will post about the finished article soon. 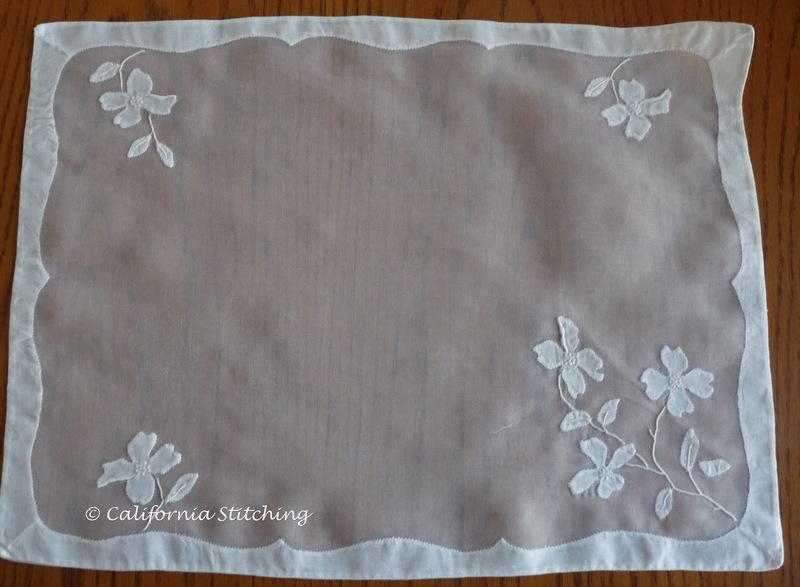 I'm back from the SAGA Convention in Anaheim and have been quite busy working on my projects, but want to give you a peek of what we did besides stitching. One of the most important activities in SAGA is their Wee Care Program. You can read about the program by following the link. In short, we make gowns for critically ill babies that are donated to local hospitals. 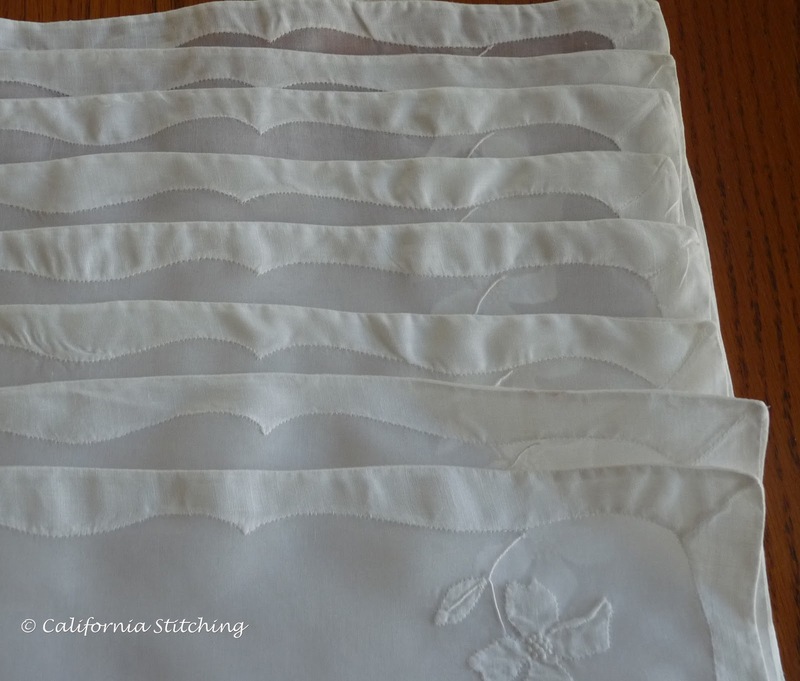 They are then used for burial garments or to have something lovely for the baby's short time on this earth. Here is part of the display of the lovely gowns that were donated. You can certainly see that the ladies who made them put quite a lot of work into them. 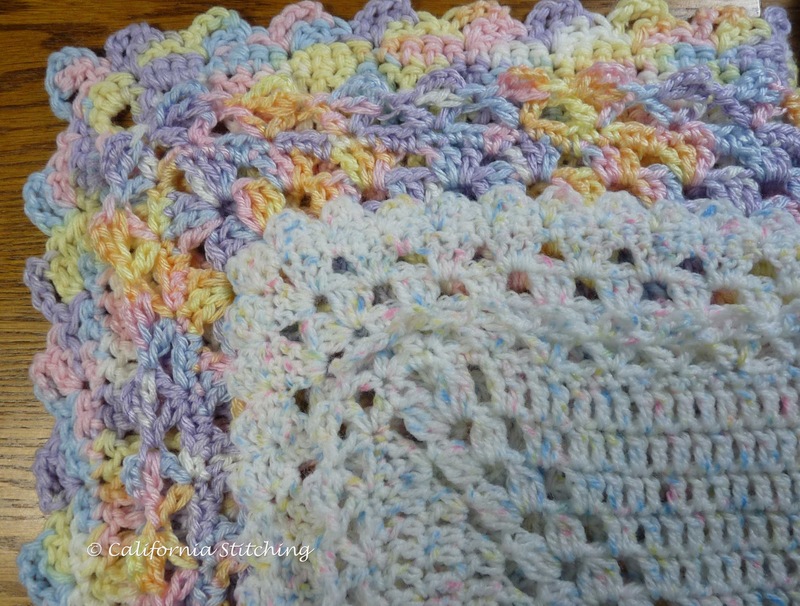 I managed to bring in only four, so I really need to step up my smocking so I'll have more to donate. One of the ways SAGA raises money is to raffle off baskets of goodies that are donated by chapters, teachers, board members or anyone else who cares to donate. Some of them are quite large and luxurious, others smaller but packed with lovely things. I won this basket donated by Jeannie Baumeister of the Old Fashioned Baby. It has three patterns, her book of Heirloom Embroidery, and buttons, buttons and more buttons, most them vintage and all of them pearl. No plastic buttons for Jeannie! This was one of the very best baskets at the Convention. Many of the chapters also donate table favors that are given out at each meal. One of the chapters I belong to, Sandcastle, made the scissors fob on the left. We received lots of useful items, including a wool pincushion, needle magnet, two fabric bags, fabric wash donated by Kathy Awender and so on. 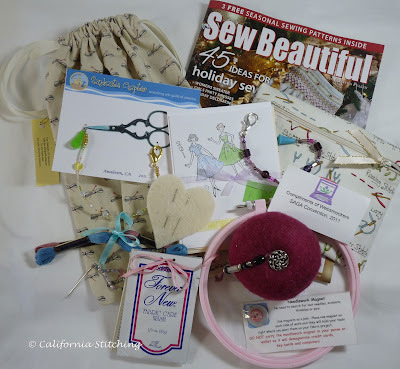 Every single item is sewing related and is greatly appreciated. Thanks to all of you who donated them! I've been working on a Schwalm Needlebook from one of the classes I took, and I'll post about that soon. Today was a half day class as the Convention has its Market in the afternoon. 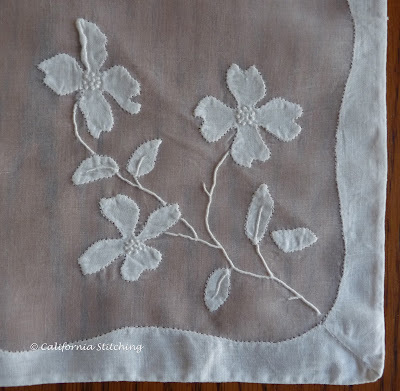 Which was fine, as I needed something a bit simpler after two intense days of very fine handwork in Jeannie Baumeister's "Rosebuds and Hemstitched Baby Dress". 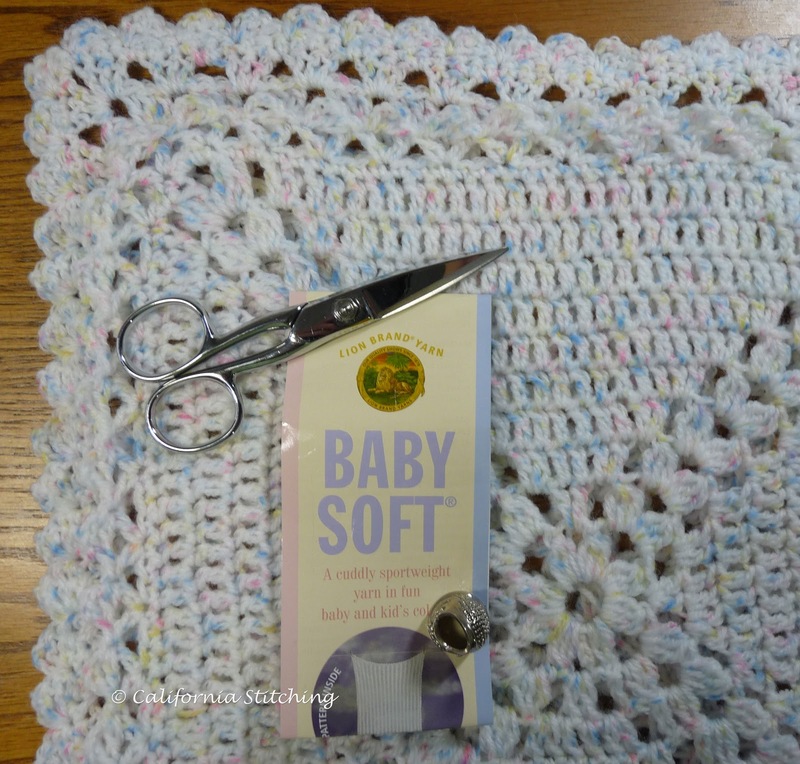 I took Susie Gay's class, "Beauty from Scraps: Padded Baby Hanger". Susie is the proprietor of Berryhill Heirlooms in Smithfield, Virgina. This year is the first year she has taught at the Convention, and I think she will definitely be a repeat teacher; at least I hope so. She is a natural teacher that had the class completely engaged right from the start. 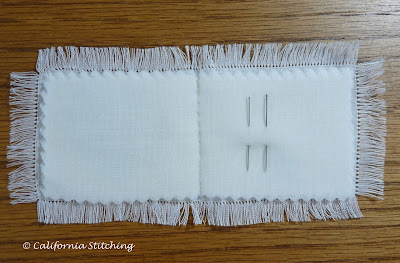 We made this darling little hanger for baby dresses out of scraps of fabric, lace and silk ribbon. When I get home I'll post a better photo. This was taken in my hotel room and loaded on my laptop which doesn't have any good photo editing software. What was so good about this class is first and foremost, it was pretty easy! And as I mentioned earlier, I was really ready for easy! 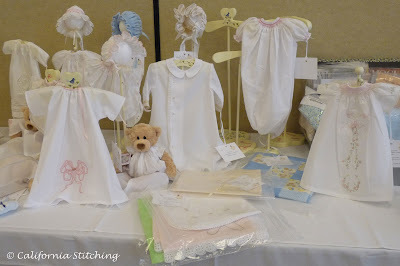 Susie makes some lovely garments and always makes a matching padded hanger for each, and showed us several examples of hangers that she has made in the past. This was a class that not only gave us a pattern but included several variations that we can use to create hangers to match our own creations. This afternoon was the Market, in which many of the teachers and other vendors held an open shop. I dropped a considerable amount of cash today, but bought some lovely things which I'll share with you on another post. One of my favorite vendors was here, Luc Smiers of Fine French Laces. Luc wasn't here but had representatives selling a great selection of Maline laces at unbelievably low prices. So now it's Friday night and I'm ready for bed. Tomorrow is a very long day, what with a full day of classes then our annual banquet in the evening. Good night, and I'll post again Sunday evening or Monday morning. OK, so it is only one half hour from my house, but still, it's a stitching vacation! This is how far I've progressed on the "Rosebuds and Hemstitched Baby Dress", a two day class taught by Jeannie Baumeister. We have actually accomplished quite a bit. 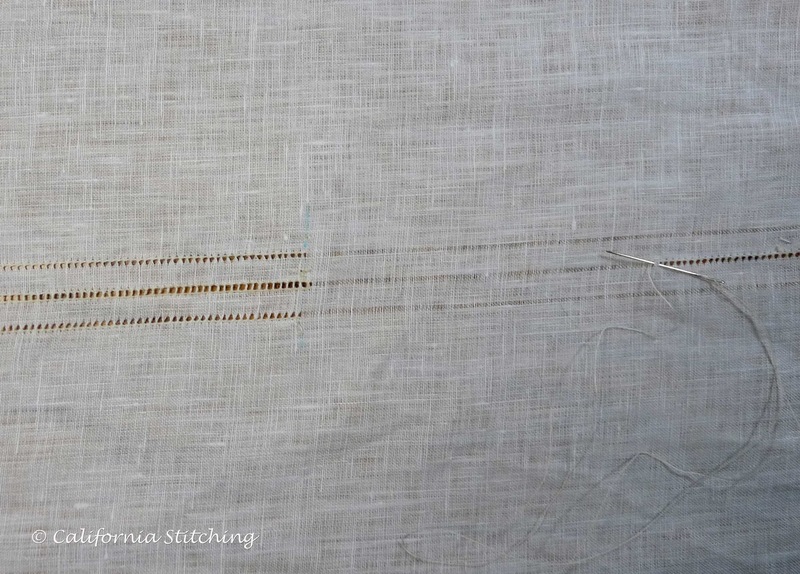 We had to withdraw threads (three on each line shown) from the linen fabric and hemstitch the remaining threads into little bundles. 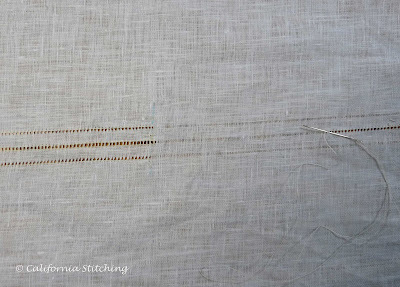 Those hemstitched lines are all of two inches long. I've managed to withdraw the threads on the sleeves (not shown), stitch down the lace insertion and sew one tuck. You can see how I've botched drawing in the neckline on the left. As it still doesn't look quite right, I'll check it over very, very carefully once I get home. We also made samples of some of the hand finishing techniques we will use later on in making this darling little baby dress. 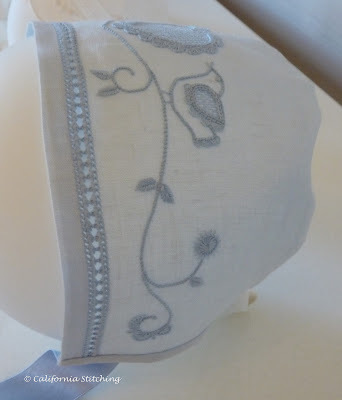 We are using a very pale blue 1000 Ulster Linen fabric which is very fine and has a lovely "hand". There are lots of blue markings where I'll make little bullion roses and lazy daisy, or detached chain, leaves. I'll work on this tonight then tomorrow I'll have a completely different class. After I came back from the Persian Peony class in San Diego, I decided to splurge and stay in the hotel for this convention. Of course, it was too late to get the special convention rate, so I'm staying at the Embassy Suites next door. My room's window faces east, so I have a beautiful view of the full moon rising all evening. What a treat! The hotel has an African theme with a mountain in the breakfast area that sports a sleeping lion on top. Every half hour he awakens and roars, just to let us all know who's king. The little kids are just fascinated. We are only two miles away from Disneyland so all of the hotels cater to families, especially with children who are visiting the theme park. It's fun to see the little ones with their MM ears and princess gowns prancing around. We are also having a mini heat wave with temperatures in the high 90's. Tomorrow should be a bit cooler, with normal 70's by the time the convention winds up. I ran into a friend I met at the first convention I attended so we went out for sushi tonight and had a great time. Now it's back to stitching so I can get a bit more accomplished on this dress and then early to bed. Last night I stayed up way too late working on the hemstitching and watching bad Star Trek movies. Not tonight! I was unable to save the photo as a smaller file, so please let me know if this takes an inordinate amount of time to load. 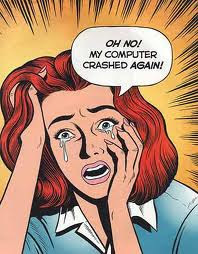 I am using a laptop which does not have Adobe Photoshop, so I am fairly limited in what I can do. I'll do much better once I get back home and can edit the photos. 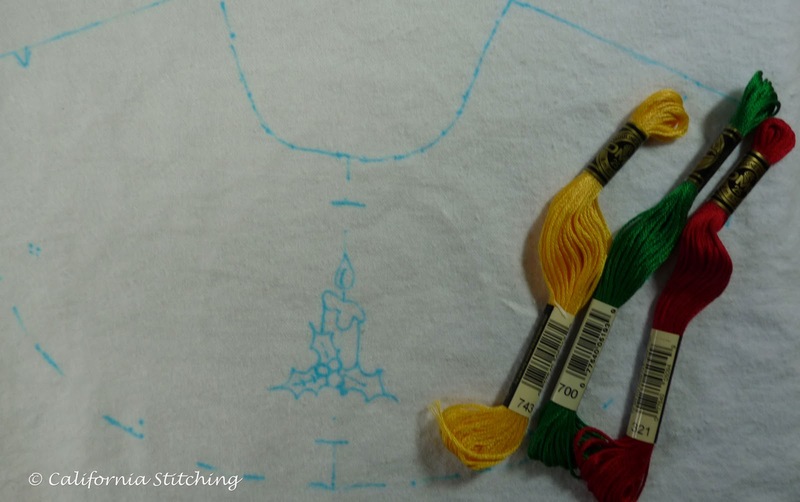 Keep cool and Happy Stitching! Last weekend, after coming home from the Persian Peony Class, I took a few hours to attend a local quilt show. 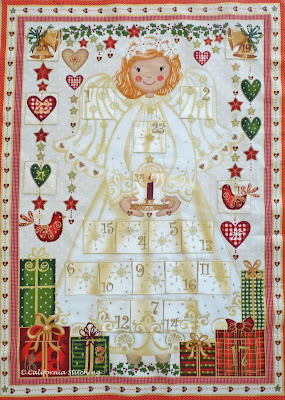 I really didn't buy much, but couldn't resist this darling angel Advent Calendar by Makower UK fabrics. I love their fabrics, as they have a somewhat heavy hand, and generally have plenty of gold, especially in their Christmas fabrics. I spent some precious time sewing all the pockets on the panel, when I really should have been working on the aforementioned Peony or my terribly neglected Golden Pomegranate. The really bad part of this is that I have two older Makower Advent Calendar kits in my Christmas Fabric collection, just waiting to be sewn together. 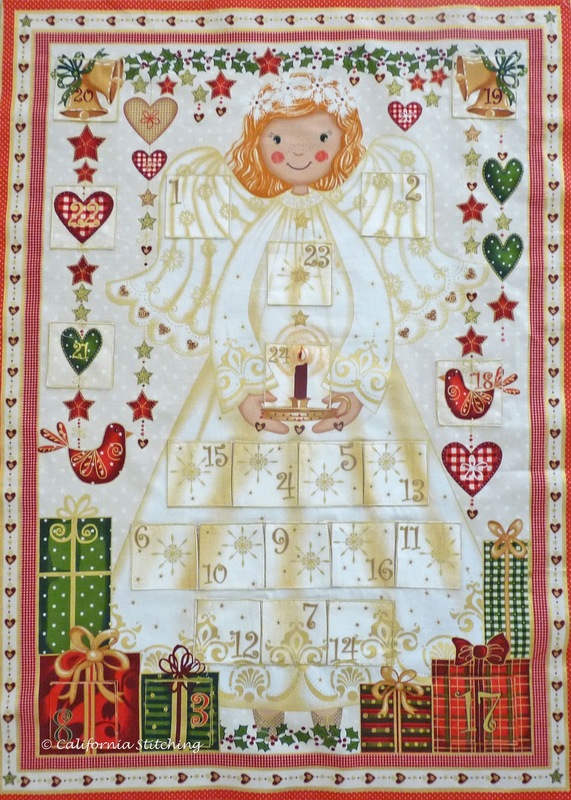 I mentioned last year that I have all angel ornaments on the Christmas tree, so I just had to have this calendar to go with it. The trouble is, there aren't any children around to get the treats in the pockets. 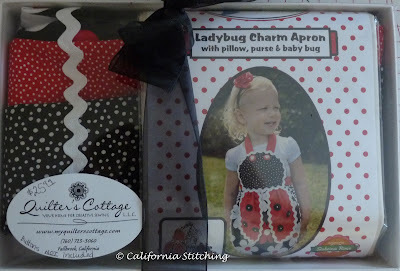 I also picked up this darling Ladybug Charm Apron that will be perfect for my granddaughter, who is 3 1/2 years old. This shop is Quilter's Cottage in Fallbrook, not too far away, so I'll have to drop by sometime. I purchased the Advent Calendar from them, too. I'm getting ready to attend our SAGA Convention in Anaheim, October 12 - 16, and if I get my act together I'll remember to take some photos and post while I'm there. Well, it's Sunday evening, and time to make dinner and get ready for the week to come. I'm only going to work on Monday, and it's my turn to drive. I did make a decision on the "Small Project for the Car" and I'll share it with you once I start it the week of the 17th. Have a great week! I know I will! I'm always on the lookout for some nice, small and relatively easy projects to work on while my carpooler has her turn driving. 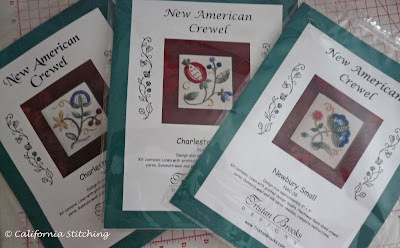 I had these Crewel projects from Tristan Brooks so I thought they would be just perfect. 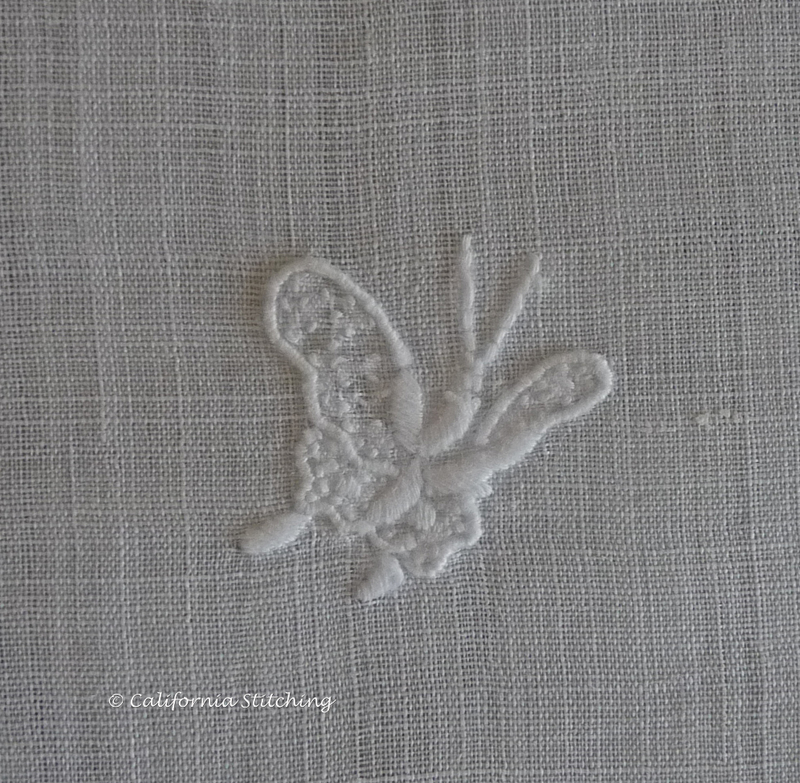 So last week I brought it along, mounted the linen on the muslin, hooped it and started working. As I was working, I kept getting this nagging feeling that this was familiar to me. So when I got home I started looking around and found that I had already done this particular kit and even posted about it over a year ago. So how on earth did I manage to wind up with two kits? As far as I can remember, I treated myself to three kits a few months ago for my birthday. I bought these but only posted about the Elizabethan Pencil Box. I purchased the kits shown above, the two Charleston Smalls and the one Newbury Small, but didn't realize at the time that I bought the kit I already own. Sheesh! The brain seems to be going a bit soft. So I'll give away the one that's already completed and mounted into a trivet then figure out what to do with the rest. That herringbone leaf is driving me crazy. I've started it three times and have already taken out the latest try. I'll lock myself in my sewing room and not come out until it's complete. One thing that I really like about this kit is that the kit makers have made the printed design much thinner and changed the color to a light brown (or sepia). It was a thick green before and very difficult to cover, especially with the lighter colored wool. It doesn't look like we got much done on the Persian Peony Tile, does it? This was the result of two intense days of stitching, plus homework. We had a wonderful time in the class; Jane Nicholas is a very gifted embroiderer and teacher, who is able to make the complicated embroidery look simple. She showed us exactly where to sink threads to make it all look so professional. She is also a commanding teacher who has no qualms about telling everyone to stop what they are doing and look at her so she can illustrate a point. That really helps to keep repetition down to a minimum and saves everyone time. Towards the end of the first day we were starting to get a bit punchy, so she told us, "I came a long way, so if I'm still standing, you're still stitching." That quieted us down and we got back to work. Right before we quit for the day she gave us a long list of homework to do. I'm so glad I stayed in a hotel instead of driving home, as I had a good three more hours to stitch. I managed to get it all done and was ready for the next day. At the end, she gave us some words of wisdom as to how to proceed to finish the project. She said to focus on one group of items at a time, finish it off, then go on to the next group. For instance, finish off all the stems, then proceed to the leaves, then the peony, the buds, and so on. 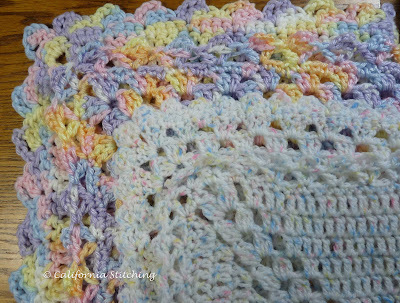 I think I'll finish off the border to get rid of those dangling threads. Much credit goes to Muchas Manos, the local EGA guild in San Diego. They did a wonderful job in setting up the course, from choosing the venue to providing snacks and lunch recommendations. You couldn't find a nicer group of ladies! I even joined their local guild, so now I'll have more info on upcoming classes. 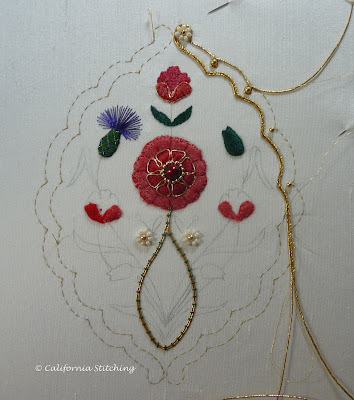 This group seems to be interested in surface embroidery, which in my experience, is rare. Most of the local guilds focus on needlepoint and counted cross stitch, so it's really refreshing to be with a group that likes surface embroidery. I'll keep you posted on my progress. Today is a lovely Saturday and I have way too many errands to run, but hope to get in a few hours of stitching tomorrow. Have a great weekend!